I like to think that the vast majority of us who provide speech and language therapy services online are doing so because we value the flexibility that it adds to our clinical practice and because we’re trained in implementation. However, I also think that it is always wise to do your research as a consumer before starting a therapeutic relationship with a clinician. On that note, if you’re thinking of starting online speech therapy, here are 4 questions I think are essential to ask before your first session. Every SLP, whether they work in a traditional or telepractice setting, is required to be licensed by the state in which they work. Additionally, most SLPs also have their Certificate of Clinical Competence (or CCCs ) from the American Speech-Language Hearing Association. For example, I am licensed in Oregon and Washington and I have my national CCCs. For telepractice, a clinician must also be licensed in the state where their client is at the time of service (read the ASHA statement on this here). I live in Oregon, so if I want to see a client in Florida, then I need to be licensed in both Oregon and Florida. ASHA is currently tackling reciprocal licensure across state lines, meaning that this issue is likely to disappear in the coming years. This will greatly increase our ability to provide services while still ensuring laws and regulations that protect consumers and is eagerly anticipated by the profession. For the time being, though, always check licensure. 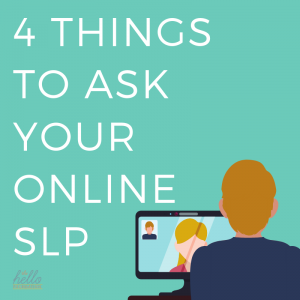 An SLP does not need to be specially certified to provide services online. There are telepractice certification programs (some are better than others) and some clinicians may opt to pursue this specialized training. It is not, however, required, nor is it necessarily an indication of competency. I recommend that you ask your clinician about their experience and what brought them to telepractice. Additionally, they should be able to answer your basic questions about equipment, the platform that they are using, and their telepractice and therapeutic philosophies. I like to remind consumers and online providers that teletherapy is just the mode of delivery, not the therapy itself. You still want to make sure that your online clinician is competent to treat you or your loved one, just as you would in the brick-and-mortar world. Your online clinician should know the basics of HIPAA and FERPA and be able to walk you through their risk mitigation strategy in simple terms you can understand. You need to be an informed consumer about how your video and any stored documents are protected. While this can be a moving target as technology changes, it is important that your privacy and data protection are a top priority for your clinician. It’s possible that your clinician is in-network for your insurance AND that your insurance company will reimburse for online services. If this is the case for you, excellent! However, given the constraints of insurance credentialing and the constant shifts in how/whether teletherapy will be covered, it is not the most common situation. What is more likely is that you will have to pay out of pocket for services and then submit documentation for out-of-network coverage. This can be a pain, so be sure to talk to your clinician about what they know and how they’re able to help you. As with anything related to technology and healthcare, the landscape changes frequently. My best advice is to keep asking questions. It’s the best way to make sure that you have a clinician that is as focused on meeting your needs as you are.